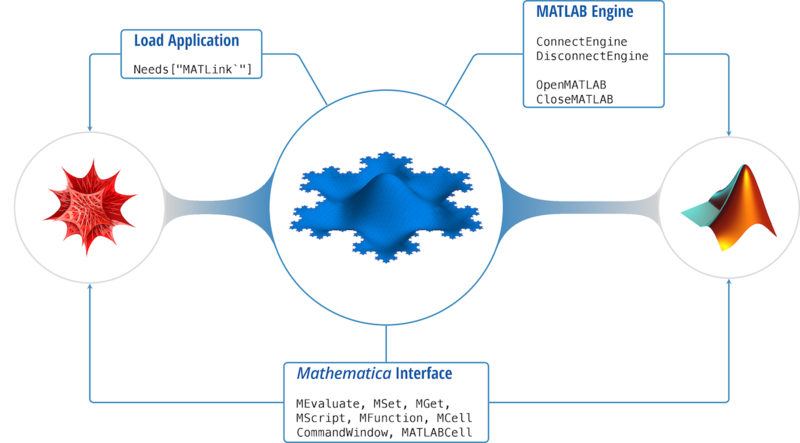 MATLink is a Mathematica™ application to communicate with MATLAB™, providing functionality to easily transfer data between the two systems, and use MATLAB functions, scripts and toolboxes from within Mathematica. MATLink is not a substitute for MATLAB, nor is it a replacement for actual knowledge of MATLAB and Mathematica; it is merely an application that allows the user to harness the power of both computational systems to program and develop more efficiently. a list of known issues, which document known bugs, missing functionality, and other limitations of MATLink (mostly due to the limitations of the MATLAB engine). ConnectEngine and DisconnectEngine, which interacts with the MATLAB engine. OpenMATLAB and CloseMATLAB, which interacts with MATLAB. OpenMATLAB, automatically calls ConnectEngine if the engine is not running, so one can launch MATLAB directly with it after loading the package. Similarly, DisconnectEngine will automatically terminate any open connection to MATLAB before shutting down the engine. MATLink uses a session folder in $TemporaryDirectory to save scripts and functions defined during the current session. These are removed when DisconnectEngine is called, or by the operating system (typically after a reboot or daily, depending on the system), if there are any abandoned directories after a crash. To manually remove those folders, run MATLink`Developer`CleanupTemporaryDirectories. ConnectEngine will connect to the MATLAB engine using MathLink. On linux and OS X, if the mengine binary is not found, ConnectEngine will try to auto compile it. ConnectEngine creates a session directory in $TemporaryDirectory to which MScripts are written. This directory is automatically removed when DisconnectEngine is called. DisconnectEngine will terminate the MathLink connection with the MATLAB engine. If a MATLAB connection is alive, DisconnectEngine will terminate it before shutting down the engine. DisconnectEngine deletes the session directory in $TemporaryDirectory that was created by ConnectEngine. OpenMATLAB will start an instance of MATLAB for use with MATLink. CloseMATLAB will close the currently open instance of MATLAB. CommandWindow is just a Mathematica function that activates a native MATLAB command window interface. With this, one works directly with MATLAB, independent of MATLink (although the variables are still accessible via MATLink). Since there is overhead in transferring instructions and output with MEvaluate, it is advisable to not display output where not necessary (both, in MATLAB and Mathematica). If you need to run the same set of instructions repeatedly, use an MScript instead of MEvaluate. MEvaluate["code"] will execute code in MATLAB as if it were entered at the command prompt and returns the output as text. MEvaluate, when successful, will always return a string containing the output from MATLAB's command window. MEvaluate performance suffers if the output is not suppressed in MATLAB code. If you do not need to see the output of MEvaluate, use MEvaluate["command;"] instead of MEvaluate["command"];. The output length of MEvaluate is limited to approximatey 100,000 characters. The rest will be truncated. CommandWindow["action"] will perform "action" on MATLAB's built-in command window. This function works only on Windows. CommandWindow["Show"] displays the command window. When an evaluation is not in progress, this window can be used to input MATLAB commands independently of MATLink. CommandWindow["Hide"] hides the command window. MATLABCell creates a program cell in the current notebook, whose contents are interpreted as MATLAB code. Any supported datatype can be transferred from Mathematica to MATLAB and vice versa using MSet and MGet respectively. However, one must be aware of the overhead involved in data transfer (when using any link technology) and avoid programming pitfalls that result in unnecessary back-and-forth data transfer (unless absolutely necessary). It is always good practice to transfer as much as possible in one go, and only transfer what is necessary. Every effort has been made to convert quantities to native data structures in each system (such as arrays in MATLAB and lists in Mathematica) and allow the user to retrun the same data to the originating system without loss of structure, but there are certain exceptions (MATLAB cells). See the translation rules for more information. MGet["var"] will return the value of the variable var from the MATLAB workspace. Data structures are translated into a Mathematica compatible format. MATLAB works with floating point values by default. Even array indices are floating point, and such values need to be explicitly rounded in Mathematica before they can be used as indices again. Do not attempt to use MGet on objects (classdef objects) or data structures which contain objects. This will crash MATLAB because of a MATLAB bug. See the known issues section for additional details. MSet["var", value] will assign value to variable var in the MATLAB workspace. value must be in a MATLink compatible format. MCell is an inert head used with MSet to indicate that the list be interpreted as a MATLAB cell data structure. MATLAB programming involves script files, which are a series of sequential instructions to the interpreter (executed in the base workspace) or functions, which take zero or more inputs and return zero or more outputs (executed in its own workspace). The MScript and MFunction functions allow one to execute MATLAB scripts and functions from within Mathematica. This makes it easy to reuse code found online, either on the MathWorks File Exchange or elsewhere, instead of reimplementing it in Mathematica. In MATLAB, one can define functions to have completely different behaviour based on the number of output arguments for the same set of input arguments. This is at odds with the behaviour in Mathematica (and in functional programming languages in general), where a function's behaviour is determined solely by its inputs. To bridge this divide, MFunction offers the functionality to use the multiple output form of MATLAB functions, but the number of outputs must be set explicitly when defining the function. MScript["scriptname", "commands"] will create a MATLAB script containing commands. MScript["scriptname", "commands"] returns MScript["scriptname"], which can be evaluated using MEvaluate. When creating new scripts, MScript will not overwrite exsiting .m files. To force overwrite an existing file, use the option "Overwrite" -> True (default value for "Overwrite" is False). MFunction["func"] represents a MATLAB function func (that is on MATLAB's path), and can be called directly from within Mathematica. MFunction["func", "body"] creates a new .m file with the contents body and returns MFunction["func"]. Anonymous functions defined in this manner form a closure, as in MATLAB. Use MFunction["func", "OutputArguments" -> n] when func returns more than one argument (default value for "OutputArguments" is 1). If func returns no outputs (or to suppress output), use MFunction["func", "Output" -> False] (default value for "Output" is True). 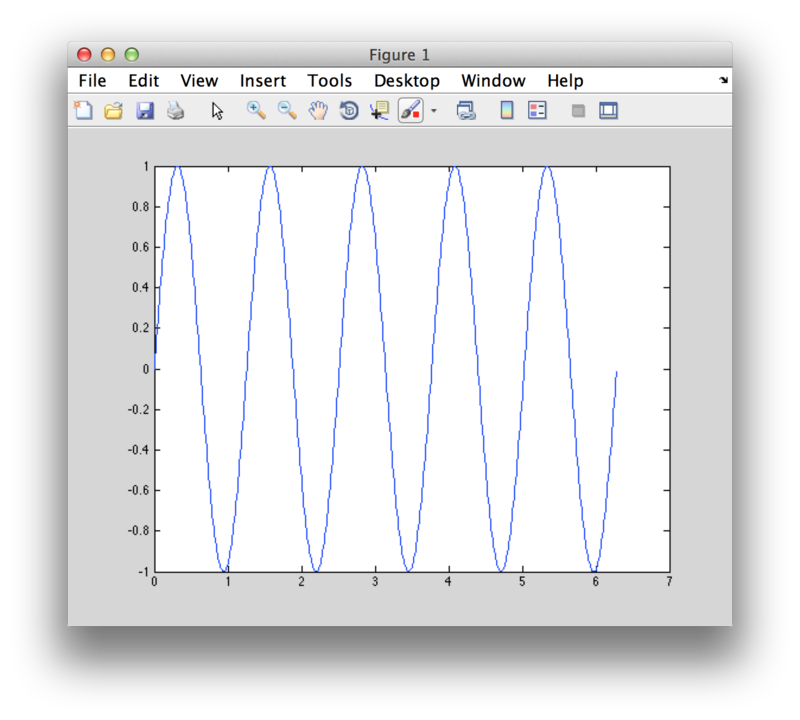 Note that MATLAB plots will be opened in a new window, unlike Mathematica plots which are displayed inside the notebook. When creating new functions using the syntax MFunction["func", "body"], MFunction will not overwrite exsiting .m files. To force overwrite an existing file, use the option "Overwrite" -> True (default value for "Overwrite" is False). If the first character in "body" is @, then the function is defined as an anonymous function in MATLAB's workspace and no function file is created. By default MFunction assumes a single output argument, which causes errors in some MATLAB functions that return no output. Use "Output" -> False in such situations. This section documents the internal rules that govern the translation of data structures from MATLAB to Mathematica and vice versa. You do not need to do this conversion, but you should be aware of how it is converted so that you can design your programs accordingly. All other rectangular lists of lists (any dimension) are converted to an identical sized array. String is converted to a 1×N char array, where N is the string length. Simple lists of rules are converted to a struct if all the LHS of the rules is a string, the RHS is a supported datatype and there are no duplicate fields. The OS X (and possibly Linux) versions of MATLAB R2014a contain a bug that breaks MATLink. Unfortunately this bug is in a core MATLAB Engine feature MATLink relies on, and it is not easy to work around it. Until this is resolved, please consider using earlier versions of MATLAB (R2013b or earlier) on OS X or Linux to run MATLink. At the moment, only arrays with less than 2^31-1 elements are supported. Note that this is true for matrices and multidimensional arrays as well: the total number of matrix elements may not excede 2^31-1 even if the matrix has fewer rows and columns than this. As an example, the largest supported square matrix can be of size 46341 by 46341. As a reference point, a double precision array with the maximum number of allowed elements would take up 16 GB of memory, so this limit should be more than sufficient for most applications. Inf and Nan are not supported at the moment. The values returned to Mathematica are not safe to use: operations on them give unpredictable results. Now running MGet["m"] will crash MATLAB because m is an object. MGet["s"] will crash because s contains an object. The MATLAB engine cannot read MAT-files in a format based on HDF5. These are MAT-files saved using the -v7.3 option of the save function or opened using the w7.3 mode argument to the C or Fortran matOpen function. As of R2013a, MATLAB does not save .mat files in this format by default, unless its settings are changed. MGet and MSet do support Unicode strings, and will preserve Unicode characters. However, MEvaluate will not preserve unicode characters in its output. MEvaluate should handle Unicode input correctly. If you discover a situation where it does not, please report it. The reason unicode output needed to be disabled for MEvaluate is that MATLAB's C API is unpredictable and may not produce correct unicode output depending on version and operating system. In MEvaluate's output Unicode in mangled, however, MGet transfers it correctly. A workaround is using evalc. This is not used in MATLink because of unsolved issue #29. It may be necessary to use your system's default encoding instead of windows-1252. To find what it is, evaluate feature('DefaultCharacterSet') in a standalone (non-MATLink) MATLAB session.